No, no, don't worry. There won't be any 50 Shades of Grey scenes coming up. But I will try and class up the thought of red rooms and get your head out of the gutter from your thoughts of Grey's red room of pain. Mother, don't even ask. Trust me!! The thing with red, as I'm sure you're aware of is, red is a strong color. It is a very saturated, dark, regal color. 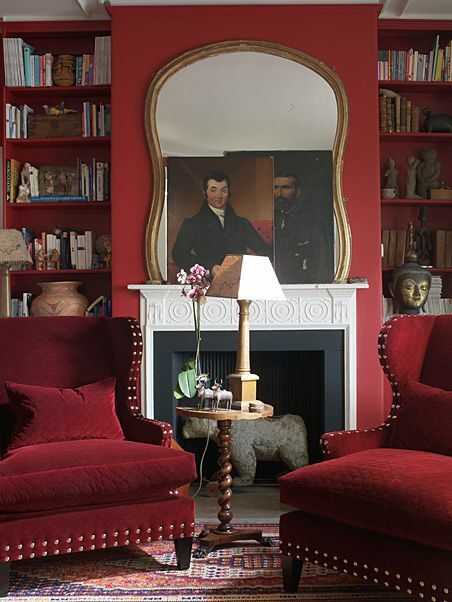 It's definitely not a neutral, so if you plan on a red room, get ready for some impact. As with a lot of paint colors, it's all about location and setting. Is your home casual, or formal? Will it seem out of place at your home? I know for me, I don't tend to gravitate to red, but I do appreciate the below photos for their beauty. And I'm sure their red rooms fit the rest of their home. One color combination that can never go wrong is red and gold. Red has such richness it's not surprising that it's shown with the "rich" color of gold. I've said this before about classics, but classics never go out of style. You will see this color combo for generations to come. I like my jewelry bigger the better. So this chandelier could be more "out there". I'd love to see a bright gold chandelier with some shine. You know, subtle. if I were to ever do a red, a crimson red like this is what i would go for. it's a moody, almost blood red. This is from a sothebys unveiling of the Robert Zellinger de Balkany Collection in Paris. There were 800 lots represented at this sale with one of the greatest collections of Decorative Arts and Old master paintings ever to appear at auction in france. But I can't keep my eyes off those malachite items and cocktail table. Black and gold? Say nothing else, you know I'd have that in my home in an instant. Notice how the modern wing chairs mimic the movement of the mirror. Small details like that is what seperates a good designer from a great designer. If you do decide to paint a room red, don't forget about your ceiling. I am a big fan of painting a room's trim, doors and even the ceiling when you're going with a bold color. It brings home the drama of the color. But if your room can't handle a red ceiling, always paint a sample of your red close to your ceiling. You may have to paint your ceiling in a warmer white or do a different ceiling treatment like wallpaper. What a great COMBINATION; rustic, contemporary, and bold. I'll tell you, it's those large doors, that make this room work. It feels breezy and light, while being covered top to bottom in cherry red. This is a Farrow and Ball paint in this month's Architectural digest from James and Nicky hilton rothschild's home. If you need to know one thing about farrow and Ball paint is that every color has a beautiful pigmentation. red and leopard, another classic combo. Designed by anne miller interiors. 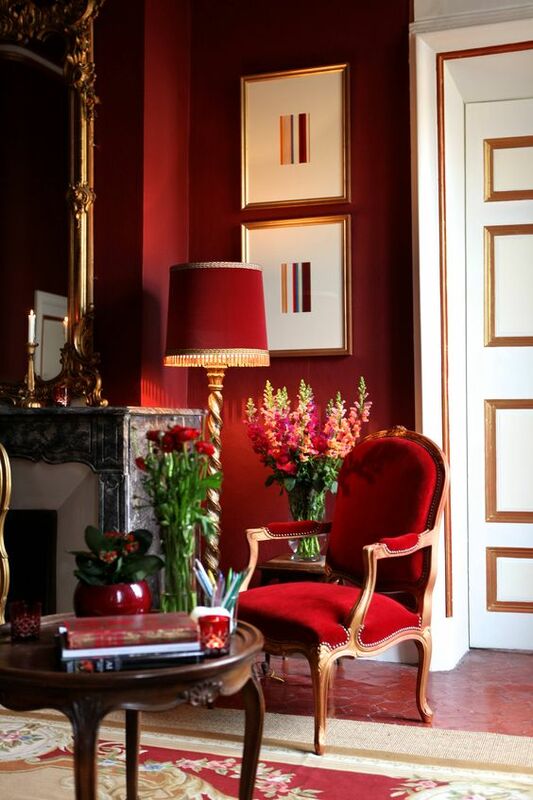 a prime example of how you don't have to paint your entire room from floor to ceiling red, but by breaking up the red with white for the ceiling, still lends itself to a bright room. oh, oh, oh, this is my favorite red room. And what's crazy is it even has red carpet and I'm still on board. I love all the different shades of red from, burgundy red, to ruby red, to purple - red. The light from the windows and mirror really help bounce all the colors around. Want to step up your red even more? Lacquer the walls in red. Lacquering your walls will also bounce the color around, like a window, but make sure your walls are prepped to perfection. The shinier the finish, the more imperfections will pop out at you. This is definite, hire a professional, don't try a DIY lacquer job, you'll just end up wasting money on more paint when you hire your painter to fix what you did. 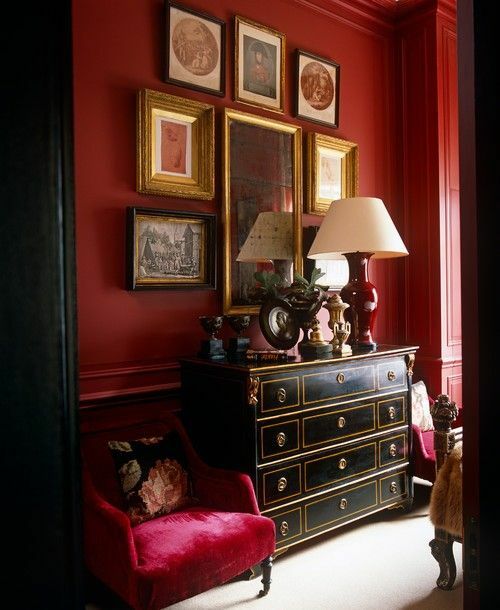 A lacquered room by the iconic designer Miles Redd from his book The big book of chic. Oh, another desk, but this time a burl wood, which is one of my favorite woods. this was a former athletic club in New York, turned high style manhattan apartment with a very large, dramatic library. I see red walls in kitchens often. I think people who paint their kitchens red think it makes their kitchen look more regal but in actuality, is it's doing the opposite. I think rust red cabinets could work in a mountain home like the one above. But again, for your everyday kitchen, DON'T PAINT YOUR WALLS RED!! Thanks so much for reading! Happy early Valentine's Day tomorrow. Spread love.